Photo Credit: © 2006 George Alexander, licensed to About.com, Inc. This self-guided walking tour of picturesque and historic Old Town Alexandria takes anywhere from about one and one-half to several hours, depending on how long you spend at each stop. If you are planning to have lunch along the way, it is a good idea to make reservations in advance, especially on the weekends. Enter the building from King Street to collect some useful brochures and maps. Travel counselors are on hand to answer any questions you may have. Out-of-town visitors may obtain free parking passes for metered street spaces. Brief History of Ramsay House - The original house was built by William Ramsay, a Scottish merchant, respected Alexandrian and close friend of George Washington's. Architectural studies of the house indicate that the earlier portions were built elsewhere in about 1724 and later moved to the current location. It was placed facing the river to give Mr. Ramsay a good view of his ships sailing in and out of the harbor. During the 19th and 20th centuries, the house became a tavern, grocery store, rooming house and cigar factory. After a 1942 fire destroyed much of the original building, the City of Alexandria purchased and restored the house. Today, in addition to housing the Visitors Center, it is a historic site marking Alexandria's oldest house. Walking Tour Directions to Next Stop: Carlyle House - Turn right (north) on North Fairfax Street and walk to the next corner at Cameron and North Fairfax Streets. Admission - $5 Age 13 and over; $3 Children 5 - 12; Children 4 and under are free; Call to find out about group rates. Listed on the National Register of Historic Places, Carlyle House offers a glimpse into the mid 18th-century family life of successful landowner and businessman, Scottish born John Carlyle. The mansion, completed in 1753, is Alexandria's only stone 18th-century Georgian Palladian style house. A charming 3/4 acre garden is designed and appointed in the style of the pre-Revolutionary period and the museum gift shop is a good place to browse for items inspired by colonial Virginia such as hand-blown glass, pottery, wooden toys, books and more. Tours are offered on the hour and on the half hour and two of the museum's three floors are wheelchair accessible. Walking Tour Directions to Next Stop: Gadsby's Tavern Museum - From Carlyle House Historic Park, turn left heading west on Cameron Street and walk one block to North Royal Street. 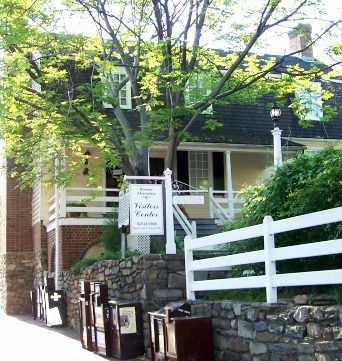 Two historic buildings, the circa 1785 tavern and the 1792 City Hotel comprise the Gadsby's Tavern Museum. Operated by Englishman John Gadsby from 1796 to 1808, Gadsby's facilities provided a venue for theatrical and musical performances, dancing assemblies and meetings and was at the heart of colonial life n Alexandria. Prominent members of Alexandria's social and political life including George Washington, Thomas Jefferson James Madison and the Marquis de Lafayette, patronized Gadsby's Tavern throughout the years. Tours of Gadsby's explore the history, architecture, arts, customs, food and more, and are fun for all ages. For a truly historical dining experience, plan to have lunch, dinner or Sunday brunch at Gadsby's Tavern. Walking Tour Directions to Next Stops: Washington's Townhouse and Lee's Boyhood Home - From Gadsby's Tavern Museum, return to Cameron Street, turn left (west) and walk one and one-half blocks farther on Cameron Street. This house is a recreation of the in-town dwelling, originally built by George Washington in 1769. Washington built the modest house in Alexandria to have a place to stay when he was not able to go home to his Mount Vernon estate because of inclement weather or pressing business. Walking Tour - Continue on Cameron Street to the next cross street, which is North St. Asaph Street and turn right (heading north). Stay on North St. Asaph Street, crossing Queen Street and Princess Street until you reach Oronoco Street. Turn left onto Oronoco Street (heading west). The Robert E. Lee Boyhood Home was originally built circa 1795 for John Potts, Jr., the first secretary of the Potomac Navigation Company, a scheme of George Washington's to link the ports of the Potomac River to the western territories. It is an impressive example of Federal architecture in Alexandria. The young family of General Henry Light Horse Harry Lee occupied the house for nine years in the early 19th century. Lee's son, Robert E. Lee who later became the leader of the Confederate States of America, prepared for his entrance to the United States Military Academy while living in this house. Today the house is privately owned, however for many years it was a historic house museum operated by the Lee Jackson Foundation. Walking Tour Directions to Next Stop: Lee-Fendall House - Continue on Oronoco Street in the same direction (west) to the end of the block at North Washington Street. Admission for Guided Tours - $5 Adults; $3 Children 11 - 17; Children 10 and under are free; Private tours and rates are available for groups of ten or more. Advance reservations are required. Call for additional information. The Lee-Fendall House, built by Henry Light Horse Harry Lee's cousin Philip Richard Fendall, in 1785. From the time it was built until 1903, 37 members of the Lee family lived in the house at different times. The only exception occurred during the Civil War when the Union Army seized the house to use as a hospital. Today the restored house offers an interpretive glimpse into the years between 1850 and 1870, highlighting the Victorian style and elegance of the time. Visitors are able to explore Lee family heirlooms including needlepoint and hand-sewn articles, original furnishings, artwork and more. Special seasonal events include afternoon tea, candlelight tours and an array of workshops and educational programs. Walking Tour Directions to Next Stop: Christ Church - From Lee-Fendall House, turn left (heading south) on North Washington Street and walk three blocks back to Cameron Street. Designed by James Wren in the colonial Georgian style and built during the period between 1767 and 1773, Christ Church was the first Episcopal Church in Alexandria. Many prominent figures have worshipped regularly at Christ Church including George Washington, Robert E. Lee, George Mason and many U.S. presidents. Traditionally, the President of the United States visits Christ Church at some point during his administration, often near the anniversary of George Washington's birthday. Visitors to this historic church are able to take docent lead tours that highlight the church's interesting architectural features and history. Walking Tour Directions to Next Stops: Friendship Firehouse and The Lyceum - From Christ Church, walk one block south on North Washington Street to King Street. Turn right (west) and walk two blocks to Alfred Street. From King Street, you will have a straight view of the majestic George Washington Masonic National Memorial. Turn left onto South Alfred Street. Established in 1774, the Friendship Fire Company was Alexandria's first volunteer fire company. The existing building was constructed in 1855, remodeled 16 years later and renovated in 1992. Historic fire-fighting equipment exhibits in the museum includes hand-drawn fire engines, leather water buckets and more. From the outside of the Firehouse, be sure to notice the fireman weathervane. Walking Tour - From the Firehouse, continue walking south to the end of the block at Prince Street. Turn left (east) and walk two blocks to South Washington Street. Dating back to 1839, the Lyceum is one of the best examples of Greek Revival architecture in the United States. Originally planned as a hall for lectures, experiments and reading, the Lyceum became Alexandria's History Museum in 1985. Highlights of the collection include antique silver, 19th-century stoneware, furniture and photographs. Walking Tour Directions to Next Stop: Stabler-Leadbeater Apothecary Museum - Continue walking east on Prince Street, stopping to take a look at the sculpture of The Confederate Soldier at South Washington and Prince Streets. Continue on Prince Street four blocks to South Fairfax Street and turn left. Opened in 1792 by Quaker pharmacist Edward Stabler, the Stabler-Leadbeater Apothecary Shop operated continuously until it closed in 1933 during the depression. In 1939, it reopened as a museum and its collection includes more than 8,000 objects including pill rollers, mortars and pestles, glass bottles, journals, letters, and more. Walking Tour - From Stabler-Leadbeater Apothecary Museum, walk south on South Fairfax Street to the end of the block at Prince Street. Continue one and one-half blocks to the Old Presbyterian Meeting House at 321 South Fairfax Street. Founded in 1772 by Scottish settlers, built in 1775 and rebuilt following a fire in 1835, the Old Presbyterian Meeting House holds historical significance in Alexandria. Among other things, it was the site of Alexandria's memorial services for George Washington. In the burial ground, there is a Memorial to an Unknown Soldier of the American Revolution. In December, members of the St. Andrew's society hold a ceremony at the grave of the society's founder, during the Annual Campagna Center Scottish Christmas Walk Weekend. Walking Tour Directions to Next Stops: Gentry Row, the Athenaeum and Captain's Row - Walk back to Prince Street and turn right heading east. Gentry Row - Walking along Prince Street's 200 block, known as Gentry Row, you will see house after house marked with Historic Alexandria Foundation plaques, indicating authenticated historical or architectural significance. Houses along this block were owned by such prominent figures as William Fairfax, one of Alexandria's founding trustees, and Dr. James Craik, surgeon-general during the American Revolution. The Athenaeum - Sitting on the corner of Prince and Lee Streets is the Athenaeum. Dating back to 1851-52 and one of only two surviving examples of Greek revival neo-classic architecture open to the public, the Athenaeum was originally built to house the Bank of the Old Dominion, where many prominent people including Robert E. Lee conducted their banking. Today the Athenaeum, which is listed on both the Virginia Trust and National Register of Historic Places, is the home of the Northern Virginia Fine Arts Association. Visit the Athenaeum Web Site for additional information. Captain's Row - Along Prince Street, between Lee and Union Streets is the block known as Captain's Row, where many sea captains built Federal style houses. Complete with cobblestones and charming architectural details, this is probably one of the most picturesque colonial village blocks anywhere. Walking Tour Directions to Next Stop: The Torpedo Factory Art Center - Continue down Prince Street and turn left, heading north, onto Union Street. Walk one and one-half blocks, crossing King Street to the block between King and Cameron Streets. Allow plenty of time to explore this wonderful art center housed in a renovated torpedo factory. The highlight of Alexandria's scenic Potomac River waterfront area, the Torpedo Factory attracts roughly 700,000 annual visitors to browse the wonderful array of ceramics, photography, jewelry, stained glass, fiber, printmaking, and sculpture. Originally built in 1918, the buildings served as the U.S. Naval Torpedo Station where torpedoes were manufactured and maintained during World War I and World War II. Once peace was declared in 1945, the buildings were used as government storage space for valuable items such as dinosaur bones and art objects from the Smithsonian and Congressional documents. Several years after purchasing the building in 1969, the City of Alexandria together with local artists renovated the factory buildings to create an art center. Today the Torpedo Factory is one of the most successful visual arts centers in the United States, accommodating about 165 artists in 82 working studios, six cooperative galleries and two workshops. It also is the home of the Art League School and the Alexandria Archaeology Museum.